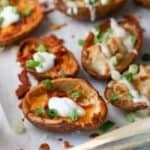 Quick and Easy Loaded Potato Skins made three ways! Perfect for game day or a Super bowl party. The secret to this easy appetizer is in the potato! I’ve said it before… potatoes are my love language. I can give up gluten… not potatoes. 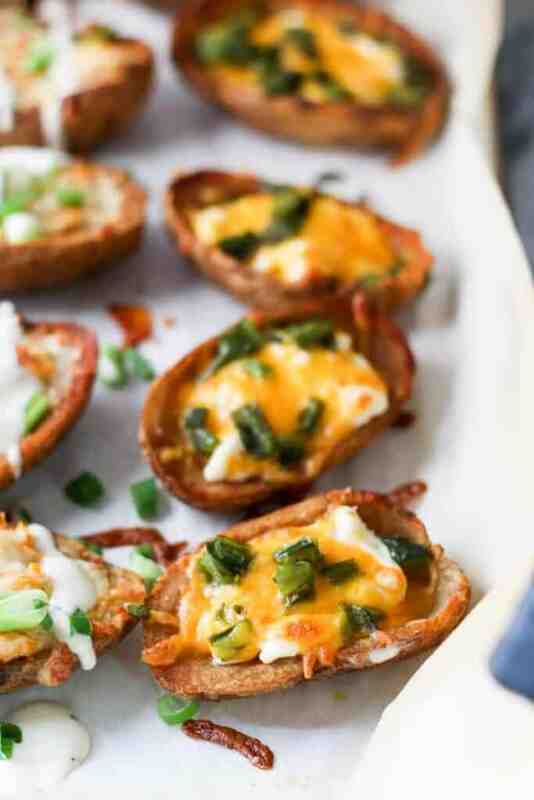 These loaded potato skins would be great for your next game day party, especially alongside these awesome wings! I made them three ways; traditional cheddar & bacon, buffalo chicken style, and jalapeño popper. All of which were seriously good! Not to mention, this trio of loaded potato skins is brought to you by a sneaky little hack that makes these one of the quickest and easiest appetizers you’ll ever make! Naked potato skins! You can find them in the freezer section at Kroger! 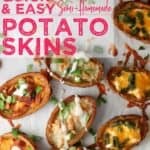 I found these guys a while ago and it’s been a potato skin frenzy in our house ever since. They are real potatoes, prepped, frozen, and ready to be loaded. All you have to do is pre-bake them, fill them, and bake again. It saves so much time and effort! Traditional: crumbled bacon, cheddar cheese, green onion & sour cream. 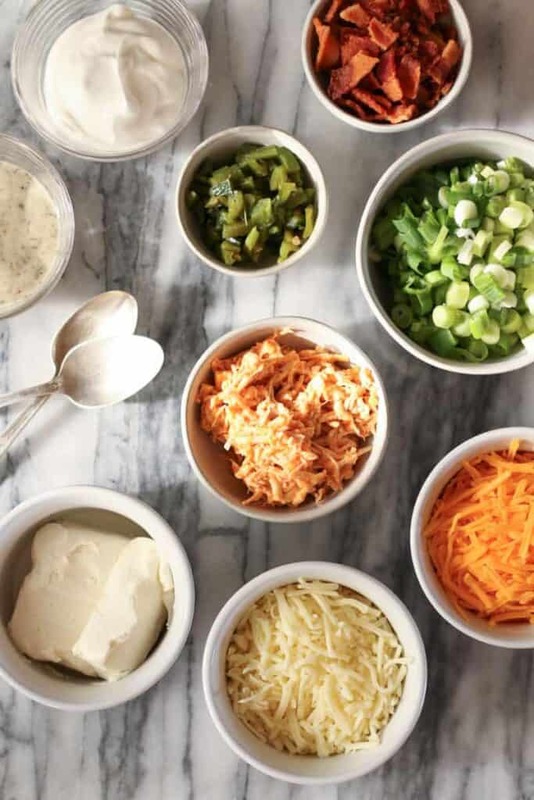 Buffalo: shredded buffalo chicken, Monterey Jack cheese, green onion and ranch dressing. Jalapeño Popper: cream cheese, roasted & diced jalapeños, and cheddar cheese. Put chicken breasts and buffalo wing sauce in the instant pot. Press Poultry/Manual button for 12-15 min. NPR & Shred the chicken. Place 3 jalapeños on a baking sheet. Roast in a 425° oven for 10-15 min, rotating to char all sides. Place peppers in a bowl and cover with plastic wrap. Let steam for 5 minutes. Scrape the skins off of the jalapeños, remove the seeds, and dice. Pre-bake the naked skins until crispy. Load with cheeses, chicken, jalapeños, and bacon as desired. Bake until cheeses are melted, bubbly, and warmed through. Top with remaining toppings: green onions and ranch dressing as desired. All in all this appetizer comes together in under 30 minutes! 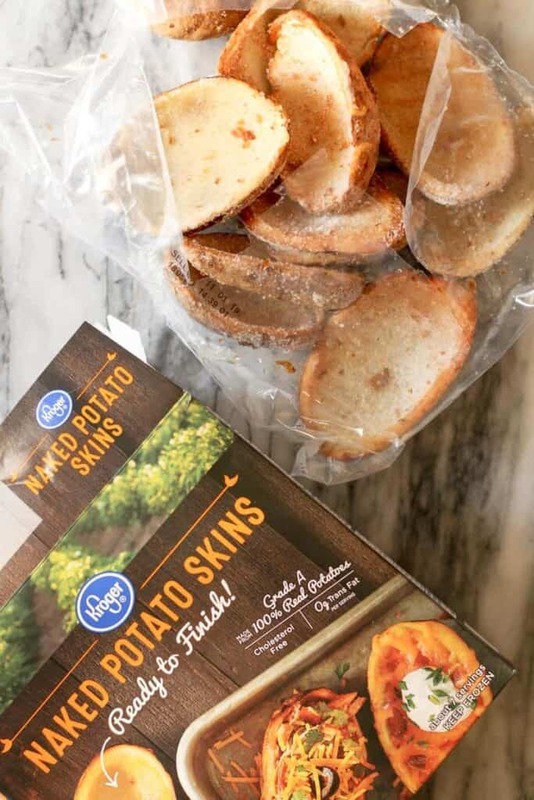 I like keeping a box of these naked potato skins stashed in the freezer. When the need strikes, you’ve got all you need for a quick lunch or easy appetizer! 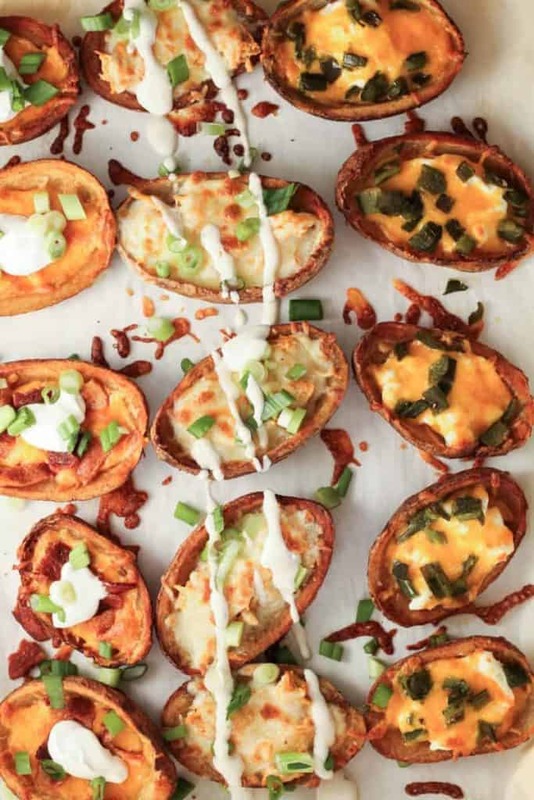 Quick and Easy Loaded Potato Skins – 3 ways! 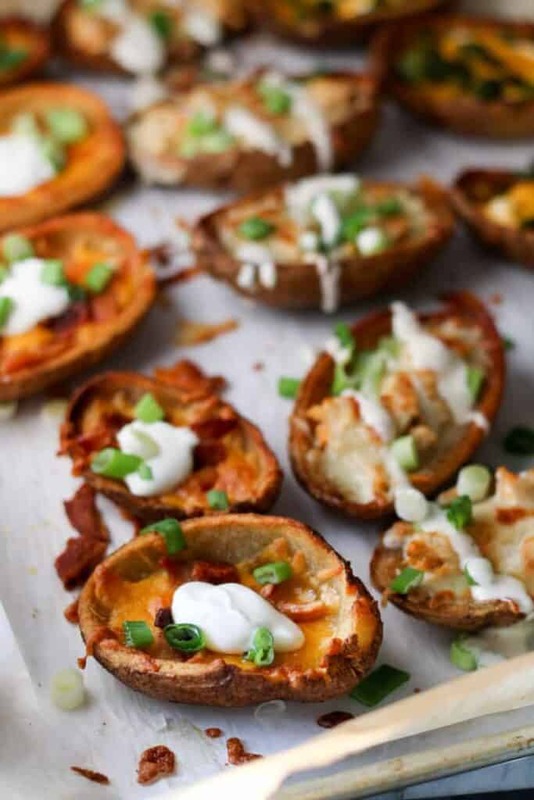 Quick and Easy Loaded Potato Skins – Three ways are perfect for game day or a Super bowl party. The secret to this easy appetizer is in the potato! Preheat oven to 425°F. 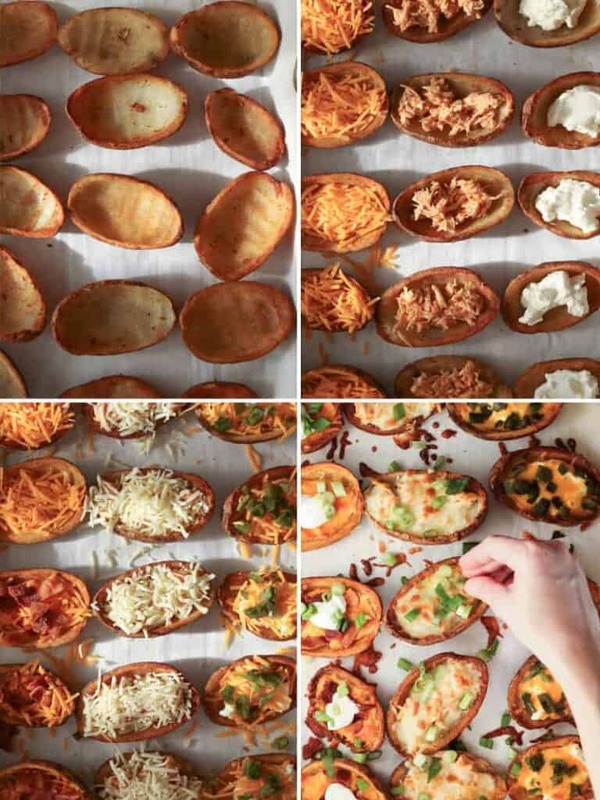 Arrange potato skins on a sheet pan, cut side up. Bake for 10 min. Remove the potato skins from the oven. Top 1/3 of the potatoes with cheddar cheese and bacon. Top the next 1/3 with about 1 Tablespoon of cream cheese, a sprinkle of cheddar cheese and diced jalapeños. Top the last 1/3 with shredded buffalo chicken and Monterey Jack cheese. Put the potato skins back in the oven and bake for 5-10 more minutes or until filling is hot, cheese is bubbly, the tops are light golden brown, and the potatoes look crispy. Remove from the oven and put a dollop of sour cream on the cheddar bacon potatoes. Drizzle the buffalo chicken skins with ranch. Sprinkle green onion on the bacon and buffalo potato skins. *There are about 12 naked skins in each 1 lb box. I didn’t know you could buy empty potato skins! What a great discovery and recipe! Thanks for posting this.